AMBALAPADY - MAHAKALI AND JANARDANA TEMPLES AMBALAPADY - MAHAKALI AND JANARDANA TEMPLES - Shiva Maha Purana, Vishnu Purana, garuda purana, bhavishya purana, skanda purana. There are two popular temples in the temple town of Udupi which are generally visited by most of the pilgrims coming to see Krishna in Udupi. 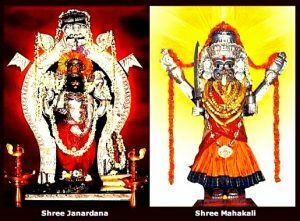 These are the temples of Mahakali and Janardana located in Ambalapady. The existence of these two temples together is itself considered rare, apart from the interesting history of the shrines. According to legend, Ambalapady had been the centre of a group of villages called ‘Nidamburu Magane’ administered by a family of Jain chieftains of the Banga dynasty. About five centuries ago, one of the descendants of the royal family turned into an ascetic and the administration was taken over by a Brahmin family called ‘Udupas’. A stone inscription, at the temple site, records that the present shrine of Sri Janardana is regarded as the principal deity of the temple and Sri Mahakali was also worshipped. The Janardana shrine is a granite structure built in the Chola architectural style, supported by stonewalls at the outer edge. A remarkable feature of the structure is that it has been made waterproof without the use of any cementing material. The Janardana idol is complete with disc, conch, mace and lotus in his four hands. The temple itself is a traditional construction with the usual Dakshina Kannada architectural features consisting of ‘Garbha griha, Theertha mandapa, Pradakshina Patha and Dhwaja Stambha’. A major attraction here is the annual Rathothsava which is celebrated during the month of Magha, corresponding to February. A special feature of this festivity is the ‘Oracle’ possessed by the Goddess Mahakali which welcomes and dances in front of the person carrying th image of Lord Janardana. The shrine of Mahakali is located on the southern side of Janardana temple and is facing the west. The idol of goddess is exquisitely carved in wood and painted profusely in bright colours. The main festival in this temple is during ‘Navarathri’ (Dasara), when thousands of devotees attend the ‘Chandika Homa’ and participate in the cultural activities of music, dance and mass feeding. It is widely believed that mother Durga and Ganesha respond to the prayers of devotees of this deity at this time. The ‘oracle’ at the Ambalapady temple is considered to be the oldest and most sacred in the country. Popularly known as ‘Darshana’, it is a hoary tradition when on Friday evenings, after a collective prayer, offered at the Mahakali temple, the devotees are answered through a medium called ‘Pathri’.